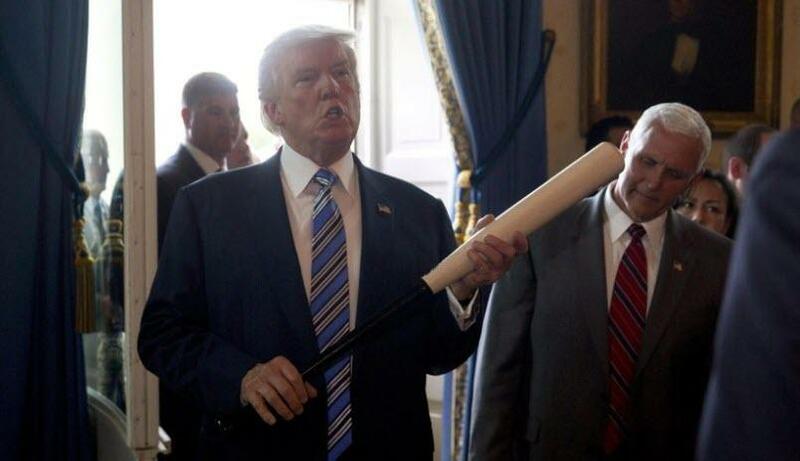 ...and the Mighty Trump at bat. The game is on the line. The entire world is watching. The count is 3 & 2. Xi just missed catching on the corner on those three pitches. The first strike? Well that will go do in the history of baseball. The pitch was so far outside, it was almost a wild pitch, but the Mighty Trump swung and missed. The ball was so far outside, no one could have hit it. Was a momentary lapse in judgement? Erratic behavior? Did the Mighty Trump want the glory of a hit rather than forcing the tying run with a walk? Or was it some brazen strategy to get the upper hand in the mental game with Xi? The second strike was equally memorable. A long, long, long, long, long foul ball. The Mighty Trump got a hold of Xi’s delivery and knocked it out of the park. Heads are still shaking at how far that ball went, but unfortunately for the Mudville 9, it was just foul. Many senior people in the Republican party blame weaker than expected showings in some regions as directly attributable to trade policy and tariffs, so there is a push to back away from that strategy. Allegedly the president’s reaction to GM closing plants was to express a desire to double down rather than back-off (which seems to be supported by @realDonaldTrump tweets. The Mueller investigation seems to be generating a lot of headlines again (and I’m hearing a lot more going on behind the scenes). In the past, there is some evidence, the president reacted to Mueller actions and leaks by lashing out with policy of his own. It does also set the stage for the President wanting a major victory heading into the new year as the Democrats take over the House and fears of a subpoena war take hold. The President is a firm believer that a good offence is a good defense (which is good for those hoping for a trade). We walk in a run. The game goes on, possibly to extra innings. The real-world equivalent is some promise by China to reduce the trade deficit, us putting on hold any new or increased tariffs and both sides agreeing that Intellectual Property rights are important and that both sides agree to focus on a plan to protect intellectual property rights. and when coupled with a less dogmatically hawkish Fed, we can get the year-end risk on rally, though people will be looking to fade that rally well ahead of January 1st. This is my highest probability scenario. I think if we get to the dinner, there is a decent chance some formal progress announcement is made. How strong that announcement is will determine the strength of the market reaction. A wild swing and a miss. Game over – we lose. In the real-world, we don’t even get to the dinner. We’ve already cancelled on meeting with Putin (for good reason, but it does show, we aren’t afraid to cancel). We are supposedly bringing Navarro to the dinner, which doesn’t seem like the best idea for a cordial dinner. Chinese papers seem to be downplaying the G-20 as a whole, and the Trump dinner. Could something happen between the sides or to the President’s agenda between now and Saturday that derails the event? Certainly, if the President doesn’t feel we are getting treated as we should, it seems within his nature. It could even be a good negotiating ploy to show China that we are deadly serious. Markets will hate that. I view this as a low probability outcome, but certainly a non-zero probability. Boom! A Grand Slam! A walk-off for the Mighty Trump. China is being hurt more than we know. Xi needs to focus on domestic issues and this trade war with the U.S. isn’t helping him as it is hurting the economy and distracting his focus from urgent matters at home. Leader for life is a good thing until you consider what would end it. Okay, that was over the top, but he has domestic economy that is declining rapidly, possible credit bubbles and wealth inequality at an extreme scale. They need soybeans. They need LNG. Stop being stubborn and agree to buy what you need form us, your largest consumer. Intellectual Property protection might be easier to give up on than we believe, as it can be very difficult to prove and at this point China may believe they have enough IP of their won that they want to protect that too. I don’t think either side has done enough talking to get to this sort of a deal, so it is also a low probability event. It wouldn’t be the first time that the market fixates on something only to decide that it doesn’t really matter in the end. Maybe a less hawkish Fed, one that is going to slow the pace of hikes and might leave the balance sheet larger (ending QT sooner than later) is all that matters near term for risk? A little bit depressing if nothing else matters, but making me less depressed about what the market reacts to seems low on the Fed’s or the markets’ list of priorities. Have a good month-end, many will be happy to see November done, and I look forward to chatting with many of you on Sunday night as futures open.